Various parts of the early modern world developed in remarkable synchrony. For most regions, the sixteenth century was marked by a significant increase in population, GDP, number of cities and their inhabitants, trade volume, and so on. This growth was energized by intense contacts between the Old and New Worlds and the respective global diffusion of valuable resources (such as silver) and domesticates. Conversely, the seventeenth century saw a full-scale crisis across almost the whole of the Afro-Eurasian space, which had repercussions in the New World as well. The novelty of early modern dynamics, however, was in that the observed synchrony was related not only to “traditional” exogenous (climatic) factors but also to endogenous (global connectivity) factors acting in the global World System. 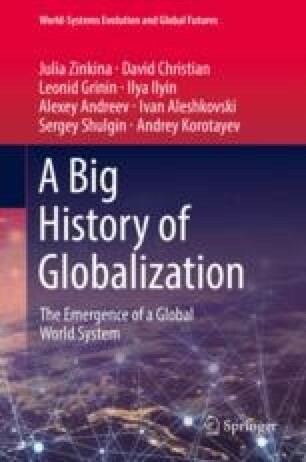 When the Global Crisis ended, the structure of the global World System began to reconfigure, as the economic, social, and technological development of the Global North increasingly outpaced the Global South. This process laid the foundations for the Great Divergence of the nineteenth century, which has had a significant impact on the structure of the World System up to the present day.